COOLSCULPTING® FOR THE COURSE. THAT’S COOL. One of the COOLest golf pros on tour is spreading the word about CoolSculpting® to get rid of stubborn belly fat. When it comes to helping men shave a few strokes off their fat-loss game, Ian Poulter means business. He's taking a not-so-cool foursome -- or Coolsome -- and whipping them into shape. Belly fat got you off your game? Enter to win a round of FDA-cleared CoolSculpting® to freeze away fat cells. See some behind-the-scenes highlights featuring tournament pro, Ian Poulter. From sharing his CoolSculpting® treatment experience, to nailing trick shots on the golf course, Ian is definitely a class act and one COOL guy. Interested in seeing more treatments? 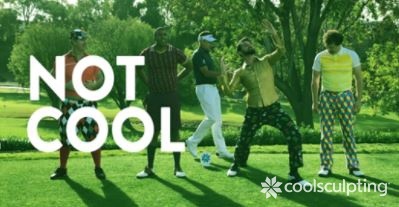 Watch Ian school the Coolsome - a group of four Not Cool golfers in serious need of swing tips and secrets for getting rid of stubborn belly fat. Aching to share your belly fat bind? If you can outdo Ian and the Coolsome, post a crazy way you have tried to get rid of stubborn fat, and tag it with #COOLnotcool. Stubborn belly fat won't go away with diet and exercise? Not Cool. Using ridiculous devices or extreme remedies to reduce stubborn belly fat? Also, Not Cool. Freezing away fat cells without surgery and with little to no downtime using FDA-cleared CoolSculpting®? Now, that's cool. Amid the endless Not Cool fads men try to get rid of their stubborn belly fat, CoolSculpting® is the nonsurgical, FDA-cleared solution that freezes away fat with no surgery and little to no downtime. It doesn't get much COOLer than that. Featured Before and After photos are not of Ian Poulter. Results and patient experience may vary. "with TREATMENT TIMES AS SHORT AS 35 MINUTES, CoolSculpting® FIT INTO MY HECTIC SCHEDULE!" ©Copyright 2018 ZELTIQ Aesthetics, Inc., an Allergan affiliate. All rights reserved. *In the U.S., the CoolSculpting® procedure is FDA-cleared for the treatment of visible fat bulges in the submental area, thigh, abdomen and flank, along with bra fat, back fat, underneath the buttocks (also known as banana roll), and upper arm. It is also FDA-cleared to affect the appearance of lax tissue with submental area treatments. In China, the cryolipolysis system is used for fat layer reduction of the abdomen and flanks. In Taiwan, the CoolSculpting® procedure is cleared for the breakdown of fat in the flank (love handle), abdomen, and thigh. Outside the U.S., China and Taiwan, the CoolSculpting® procedure for non-invasive fat reduction is available worldwide. CoolSculpting® and its design are trademarks of ZELTIQ Aesthetics, Inc., an Allergan affiliate. © 2018. All rights reserved. CoolSculpting® is the treatment doctors use most for non-invasive fat removal.